How many times would you be willing to build your church? In the Zambian bush of Africa, a modest church structure made of mud and grass can take you more than a year to construct. Then, two years later, you’ll have to build it again. In two years the thatch roof will have thinned out—devoured by wasps and other pests. During the wet season, rain will pour through the holes and onto your head, turning the floor into mud. Water will dissolve the walls. The church will become an empty shell, and the building process—molding bricks, cutting grass, plastering walls with mud—will start once more. Then, after that, you’ll have to build it again. This is the reality of your fellow believers in Zambia. They love to sing and worship the Lord, but the problem of space is persistent. Church construction isn’t a one-time project; it’s a chronic challenge—ever present and seemingly impossible to solve. Because if your church is in the bush, you might as well be alone. Far from modern conveniences, the primitive village is a forgotten relic. It takes hours in a 4 by 4 truck to get to the villages—through sand and muddy fields. Yet the Gospel reached even here—deep in the floodplains of Zambia. Someone cared enough to share the light of Jesus Christ in the furthest village. So why can’t someone help build a church? Well, we can. You can. It’s called the One-Day Church. And you can help build them in Zambia. They are a perfect solution for this vast country, where roads are scarce but the need for churches is great. Lightweight and easy to assemble, One-Day Churches can be loaded onto a truck, driven into the most rural regions, and constructed in a day. The One-Day Church consists of a galvanized steel roof and frame. Then, local materials are used to complete the walls and the floor. A steel roof is a huge upgrade over a roof of grass. Rain won’t rust the material, nor will water seep through the roof and damage the walls. Having a One-Day Church means a congregation won’t have to build their sanctuary over and over again. And this means there will be more time for members to reach out to their community and share the Gospel. Already, we’ve answered requests for more than 200 churches in this country, and there are still more that are waiting for your help. The only problem is we need more funds. We urgently need you to sponsor One-Day Churches in Zambia. Oswald Musilima is a Seventh-day Adventist Christian. He lives in the city of Mongu, located in the western province of Zambia. His congregation, Mokoko, was among the groups to receive a One-Day Church in 2013. On the day Maranatha arrived, Oswald was so excited that he went to the site to help build the church. He worked hard, and Maranatha noticed. “Someone came over to me, and said, ‘Are you willing to help Maranatha?’” remembers Oswald. After talking it over with his family, Oswald left his job as an instructor at a vocational school and joined Maranatha the next day. Since then, Oswald has traveled all over Zambia, building churches. 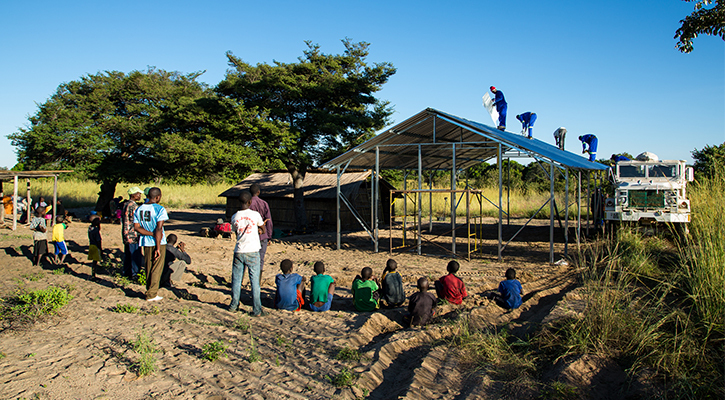 The churches he builds may take a short time—the crew averages about four hours per church—but the time in between is long, especially when they are building in the bush. The travel is not easy. Oswald and his fellow crewmembers have to drive for hours through the most unforgiving terrain. Their trucks negotiate potholes, sinking sand, thick grasses, and swampy flood plains. Emergencies require them to set up camp in places where animals roam. Elephants, lions, hyenas—this is Africa, after all. It sounds like a terribly difficult job. But Oswald disagrees. He says that there are no challenges when there is so much joy. People are happy to see Maranatha arrive. Can you imagine how they must feel? For them, building a simple church means months of labor with no guarantee of how long it will last. Then a truck arrives to answer their prayers, and in just a few hours a permanent church is built! It is truly like a dream! This is a predicament that Maranatha faces often. There are so many requests. So many pleas for help. We cannot say yes to everyone. But we could say yes to more churches if only we had more funding. We need donations for Zambia. Throughout this vast country, there are hundreds of congregations in need of a place of worship. We need to fund more churches, but we cannot do it without you. Will you make a donation in support of One-Day Churches in Zambia? It would mean so much to the congregations in need. Oswald recalls one church he built in Kaoma Central, a district in western Zambia. Word had spread that Maranatha was coming to the village of Shituta to build their long-awaited church. When the trucks started rolling into the village, what Oswald saw next shocked him. Evangelizing through structures! Oswald is living the Maranatha mission—to spread the Gospel through the construction of urgently needed buildings. But the mission needs you, too. The One-Day Church has been an answer to prayer for hundreds of Adventists in Zambia. You can help us to continue this work by making a donation for churches in Zambia. You can sponsor a share of a One-Day Church for $1,500. For $4,500, you can sponsor an entire church. You can also donate any amount toward our work in Zambia. That money will go toward one more, desperately needed One-Day Church.